Two sizes, size 1 fits from birth including premature, low birth weight/twins, to 13-18lb max. 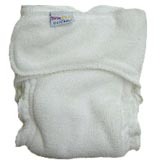 Size 2, to fit from 13lb or folds down to fit birth to potty. 2 layers of soft bamboo terry, with an opening to form pouch at the back. Aplix fastening, with overlap for smaller sizes. Three sizes, Size 2 can be used as birth to potty by adjusting poppers on the front. Very slim fitting, ideal from birth, designed to fit under most newborn baby clothes. Fits from birth including premature, low birth weight/twins, to 13-18lb max. Shaped and fitted with good elastication. Ideal for light wetters, needs boosters for heavier wetters and overnight. Velcro hook & loop fastening. Made of quality soft Organic cotton terry certified according to OEKO-TEX® Standard 100, class 1 for baby 0-3 years..
One size fits from birth to potty, or newborn size for premature/small newborns from birth..
Padded in the centre, and, with separate loose booster for quicker drying, gentle elastic at legs. Wraps are needed with these nappies. 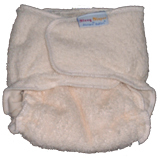 Two sizes, both may be folded down, the Size 1 to fit from premature baby to18lb, Size 2 to fit from birth to Toddler for use from birth. 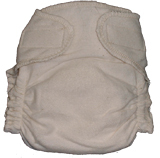 Evenly padded throughout giving good absorbency without too much bulk. Popper fastening at waist and thigh, at sides. Two size + 1 size for larger later training and overnight. Extra small for premature and slim newborns also available. XL size (known as Toddle-Ease, is good for toddlers as can be pulled up by most children as a good night time nappy with Airflow wraps. Made in Canada by Motherease. Sorry we can only sell Mother-ease products within UK.